Success! Bikolimana from Tanzania raised $890 to fund clubfoot repair. Bikolimana's treatment was fully funded on January 26, 2019. Bikolimana’s casting and manipulation treatment is going well. This treatment will make his walking easy and no longer painful. Bikolimana is a student from Tanzania. He is the fifth born child in a family of seven children. Bikolimana’s parents are both subsistence farmers. Bikolimana has clubfoot of both feet. Clubfoot is a condition in which the foot is twisted out of shape. This causes difficulty walking and even wearing shoes. Fortunately, Bikolimana traveled to visit our medical partner’s care center, Arusha Lutheran Medical Centre. There, surgeons will perform clubfoot repair surgery on January 31. Our medical partner, African Mission Healthcare Foundation, is requesting $890 to fund Bikolimana’s clubfoot repair. After treatment, he will be able to walk easily. Bikolimana's case was submitted by Joan Kadagaya at African Mission Healthcare Foundation in Tanzania. Bikolimana was submitted by Joan Kadagaya, Curative Medical Support Program-Partner Representative at African Mission Healthcare Foundation, our medical partner in Tanzania. Bikolimana received treatment at Arusha Lutheran Medical Centre (ALMC). Medical partners often provide care to patients accepted by Watsi before those patients are fully funded, operating under the guarantee that the cost of care will be paid for by donors. Bikolimana's profile was published to start raising funds. Bikolimana's treatment was fully funded. Bikolimana's treatment was successful. Read the update. Incidence is 1/1,000 live births, or about 1,600 cases in Tanzania annually. This is roughly similar to rates in Western countries, though many cases may be missed. There is no known reason for its occurrence in this region. Patients will undergo a series of small operations, casting, and manipulations during their course of treatment. Patients will stay in the Plaster House, a rehabilitation center for children in Tanzania, for as long as their recovery takes. Oeun is a 68-year-old rice farmer from Cambodia. He has three grandchildren and enjoys listening to the radio and reading scripts from the pagoda. Five months ago, Oeun developed a cataract in each eye, causing him blurry vision and irritation. He has difficulty seeing things clearly, recognizing faces, and going anywhere outside. When Oeun learned about our medical partner, Children's Surgical Centre, he traveled for four hours seeking treatment. On March 6, doctors will perform a phacoemulsification surgery and an intraocular lens implant in each eye. After recovery, he will be able to see clearly. Now, he needs help to fund this $398 procedure. He says, "I hope that after my surgery, I am able to go back to work on the rice farm and go outside independently." Vanly is a boy from Cambodia. Nearly one month ago, Vanly suffered from a severe bicycle accident; one week later, he was unable to walk and was in a lot of pain. He struggles with daily lower back pain, and has lost all control of his legs. 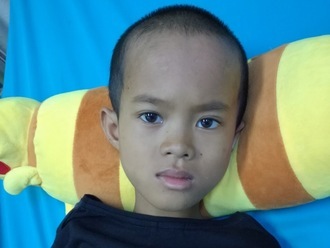 He spent two weeks at the Kantha Bopha Children's Hospital where he was diagnosed with Pott's disease; however, Vanly was unable to receive treatment because the hospital lacked the necessary medical supplies needed for his procedure. Vanly was then referred to the Children's Surgical Centre, our medical partner, for spinal treatment. The doctors will perform a decompression surgery on his lower spine, ensuring that he will regain movement in his legs and no longer suffer any pain or loss of movement. Vanly looks forward to returning to school as soon as possible, as he hopes to become a police officer when he grows up. Surgery is scheduled for April 9 and will cost $930. His mother says, "I hope that my son's surgery is a success so that he will no longer suffer from pain and can walk on his own again. He can then return to school and I won't have to worry about him as much." Lorn is a 72-year-old rice farmer from Cambodia. She has three children and eight grandchildren, and she enjoys going to the pagoda in her free time. One year ago, Lorn developed a cataract in each eye, causing her blurry vision. She has difficulty seeing things clearly, recognizing faces, and going anywhere outside. When Lorn learned about our medical partner, Children's Surgical Centre, she traveled for two hours seeking treatment. On April 8, doctors will perform a small incision cataract surgery and an intraocular lens implant in each eye. After recovery, she will be able to see clearly. Now, she needs help to fund this $398 procedure. 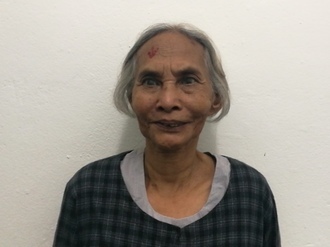 She says, "I hope that after my surgery, I will be able to see more clearly and attend ceremonies at the pagoda, as well as be able to recognize my relatives."